White, brown, wholemeal, wholegrain, granary or seeded? Pan, batch, soda or sandwich? There’s something for everyone in the family in our huge range of freshly baked breads. The nation's favourite sliced pan, and our most popular bread! Ireland's favourite sliced pan and our most popular bread. Wrapped in a distinctive yellow wax wrapper for ultimate freshness, the original "Today's Bread Today" remains a classic. This handy sized half pan is perfect for your shopping basket and bursting with 10 full slices of fresh white bread. Deliciously fresh from the wrapper but, as the name would suggest, perfect for sandwiches too. Enjoy a sandwich with some of our delicious suggestions such as Chicken &amp; Stuffing or a Club Sandwich. Our wholesome wholemeal bread is so called because it’s made from flour using the whole of the grain. Brennans 100% Wholemeal is a delicious way to add more fibre to your diet. Brennans 100% Wholemeal, made from flour using the whole of the grain, is a delicious and wholesome way to add more fibre to your diet. And now it comes with added vitamin D – also known as the ‘sunshine vitamin’ - great for strong and healthy bones. Our wholegrain bread is made from flour with actual grains in the loaf to give it a delicious taste and texture. We’ve taken our famous wholegrain bread and added some extra Vitamin D - also known as the ‘sunshine vitamin' - for strong and healthy bones. All the roughage and fibre of our delicious wholegrain loaf in a handy half pan for freshness and convenience. Multigrain combines wholemeal flour with linseed, kibbled rye, rye flour, oat flakes, malted wheat flakes, malted barley flour, rolled wheat, sunflower seeds, millet and poppy seeds for a healthy and exciting blend of flavours. Our famous ‘batch’ bread with it's trademark shape and flavour makes it a unique, much loved favourite. A smaller version of our famous much loved ‘batch’ bread. Six slices! A variant on our delicious and popular batch loaf with all the goodness of wheat bran added to make it full of fibre. Brennans Bloomer White is a delicious sliced bread which is low in fat, no added sugar and perfect for sandwiches and toast. Brennans Bloomer Brown malted is a delicious sliced bread which is a source of fibre, low in fat and perfect for sandwiches and toast. At Brennans, we're very excited about Brennans Be Good Wholemeal, a delicious high fibre bread with only 60 calories per slice. Made using only the finest ingredients, it is baked with the care and expertise that you expect from Brennans. So, if you’re looking for a bread with fewer calories per slice, but don’t want to compromise on taste, then Brennans Be Good Wholemeal is the bread for you. At Brennans, we're very excited about Brennans Be Good White Bread, a delicious premium bread with only 60 calories per slice. Made using only the finest ingredients, it is baked with the care and expertise that you expect from Brennans. So, if you’re looking for a bread with fewer calories per slice, but don’t want to compromise on taste, then Brennans Be Good White is the bread for you. We’re excited to introduce you to the newest member of the Be Good family; Brennans Be Good Wholegrain. Baked with wholegrains, its delicious taste makes it hard to believe it has only 60 calories per slice. High in fibre, fewer calories, with no compromise on taste; we hope you enjoy eating it as much as we enjoyed baking it. A delicious high fibre lighter sandwich option with only 96 calories per bread. It’s the low calorie choice that doesn’t compromise on taste. The lighter sandwich option with only 96 calories per bread, packed with delicious sesame and linseed seeds for extra fibre and taste. The perfect shape, texture and consistency for the perfect sandwich, Brennans Good For All Thick White Bread makes for a great lunch or the perfect accompaniment to a relaxing cup of tea or coffee at any time. Brennans Chia Wholegrain is more than just a delicious brown bread. Along with the great taste and goodness of wholegrain, we’ve added Chia seeds to give your body, heart and mind a daily boost. A great tasting white bread with the goodness of brown, with added wholemeal, high in Calcium, a source of fibre and has no bits. A tasty combination of Sunflower, Linseed and Pumpkin Seed gives this bread great texture and delicious flavour. Poppy Seeds and Pumpkin Seeds are known to contain calcium and minerals and when baked with wholemeal flour, they give the bread a delicious flavor and a pleasant nutty texture. Multiseed combines the delicious flavor and texture of Sunflower Seed, Linseed and Pumpkin Seed to give you an irresistible tasty bread which is a source of fibre. With 3 SmartPoints per 2 slices, WW wholemeal bread is high in fibre and a great way to enjoy bread as part of a balanced healthy diet. With 1 SmartPoint per slice, WW white bread is high in fibre and a great way to enjoy bread as part of a balanced healthy diet. With 2 SmartPoints per slice, WW Multiseed Bread is high in fibre and a great way to enjoy bread as part of a balanced healthy diet. A gluten-free high-fibre brown loaf. So tasty, it’s hard to believe it’s wheat free. A gluten-free, high-fibre, brown seeded bread. A fine traditional low fat yeast-free bread, baked with wheat flour and packed with fibre. Delicious with hearty soups and stews. Brennans High in Fibre Wholegrain bread with Chia Seeds is a delicious, simple way to increase your daily fibre intake. Packed with natural wheat fibre goodness which can improve your digestive health. Brennans Wholewheat Brown Bread is packed with the finest ingredients. High in fibre, yeast-free and with no added sugar - it’s a simple and delicious way to increase your daily fibre intake. Freshly baked and full of wholemeal goodness, our soft and chewy bagels make for a delicious tasting snack. Our winning soft and chewy bagel recipe, sprinkled with poppy seeds for added taste and texture. Have a New York style breakfast or lunch with a delicious freshly baked soft and chewy bagel, great with any topping you choose! Freshly baked soft and chewy bagels, with added wholegrain for a delicious, nutty tasting snack full of fibre. Freshly baked cinnamon &amp; raisin bagels, delicious with cream cheese and fresh fruit, or lightly toasted with butter, jam or honey. Use our Bun-Days as a base for your burgers and you can add as much garnish as you like to spice things up. The Mega Bun-Days are mega tasty and perfect for barbeques and parties. Just add ketchup, mayo, mustard or whatever tickles your fancy. These are lovely, fluffy soft baps dusted with a fine layer of flour to leave your fingers white and your appetite well and truly sated. Available in packs of 6, these delicious rolls will accompany any hot dog to make the ultimate meal. Just add mustard, ketchup, onions or whatever makes your hot dog perfect. Let your teeth sink into these soft bread rolls, filled with whatever you feel like loading them up with. Our delicious soft roll range is available with added malt grain for extra fibre and flavour. Wrapped in a distinctive yellow wax paper to seal in the freshness. Brennans thick catering white bread is perfect for those with a bigger appetite. At Brennans, we cater for your every need and we know that you may be catering for others too. This catering pan does the trick for big and small-scale sandwich making. 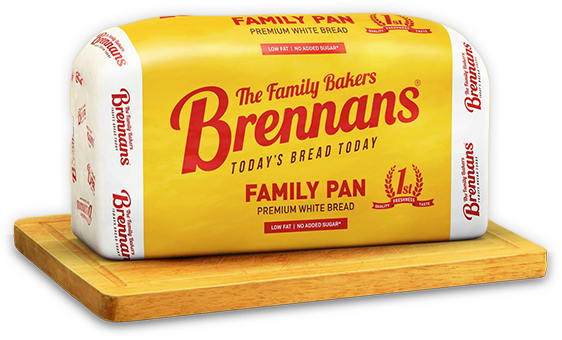 Brennans thick sliced brown catering pan is made with flour using a small amount of unground grain, giving it more fibre than white bread. Those thicker slices are perfect for big appetites. This handy brown pan, based on our Medium Catering White, is a high fibre alternative for big and small-scale sandwich making. Brennans Malted 1,200g Catering Pan is made from a special blend of flours giving it a distinctive and delicious malt taste.